In 1944, working with the Tube Alloys program (the UK's war-time atomic research program), British chemist Geoffrey Wilkinson determined the "double-humped" curve for calculating fission product yields from the slow fission of a specific uranium as a function of mass number. 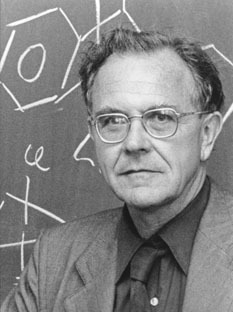 In 1952, he detailed the "sandwich" molecular structure of biscyclopentadienyl iron, now called ferrocene, which launched the new field of metallocene chemistry. In 1966 he developed what is now known as Wilkinson's Catalyst, a rhodium metal complex with three large phosphine ligands linked to the metal center that acts as a chemical catalyst for the hydrogenation of alkenes. He won the Nobel Prize for Chemistry in 1973 for his work with ferrocene, sharing the honor and honorarium with Ernst Otto Fischer, who unraveled the "sandwich" molecular scheme in his independent studies in Germany.